When people in the ancient world found gigantic ruins, they often described them as Cyclopean—as if only mythical Cyclops could have built such things. We tend not to go in for such legendary explanations today, but plenty of mysterious buildings from the past are still provoking debate. We may not know who built them, or even why. 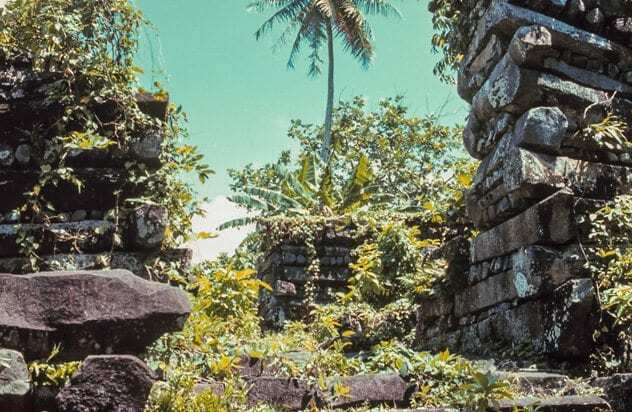 Nan Madol in Micronesia is an ancient city built on a hundred tiny islets in the sea. This watery location has led to Nan Madol being called the Venice of the Pacific. The buildings and walls of the city are constructed of huge blocks of basalt columns and coral. How the city came to be built is the subject of myth among locals. Two brother wizards, Olisihpa and Olosohpa, arrived from over the sea in a giant canoe. They sought to set up a place to worship the god of the sea and the god of good harvest. Their first two attempts to bring stones to the bay failed. It was only when they used the magic of a dragon to levitate the blocks that they managed to build the city. Descendants of the wizards ruled the city until it was abandoned. Nan Madol is still being explored to work out how it was constructed. To build the city, the inhabitants, who lacked pulleys and metal tools, would have had to move almost 2,000 tons of stone a year, each year, for 400 years. 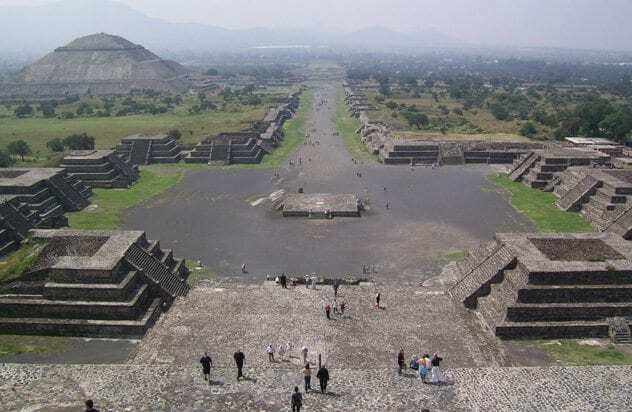 Teotihuacan is home to some of the largest Pre-Columbian structures in the Americas. At one time, it had a population of over 100,000, making it one of the largest cities in the world. Despite this pre-eminence we have almost no idea of who founded the city. It seems to have been founded around 200 BC, about a 1,000 years before the Aztec period. The city is dominated by pyramids. The largest, the Pyramid of the Sun, is the third-largest in the world. As mysterious as the city’s founding is its abandonment. Different theories have been given as to why the inhabitants left the large city. Was it revolt by the lower classes? External invasion? No evidence of either has been discovered, so it is still an open question. Puma Punku in Bolivia has attracted great attention ever since its discovery. Blocks of stone cut with precise lines and holes dot the temple complex. One weighs over 130 tons. So strange and carefully carved are the stones that they have been claimed by believers in Ancient Aliens as proof of extraterrestrial visitation. Quite why aliens would wish to build a temple in Bolivia is yet another mystery. Puma Punku was built without mortar to hold the stones together. To hold the walls up each stone was cut to interlock exactly with its neighbors. This would be skilled work even today. Further, the stones used to build the site were quarried about 50 miles away. Puma Punku has been much damaged by time and looting. At one time, it may have been richly decorated, and so its role and purpose might have been easier to discern. Carbon dating of deposits show that it must have been built at some time after AD 530. Imagine building a city for 20,000 people without the aid of modern technology. Now try to imagine building it entirely underground. 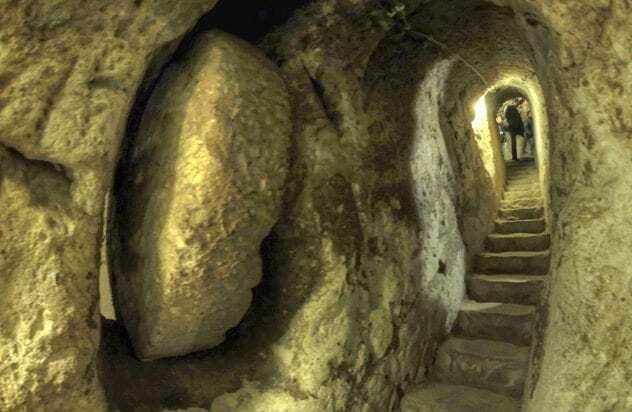 Turkey boasts several underground cities, but the largest is in Derinkuyu. The city was expanded and inhabited and used as a place to flee for protection until at least 1923. But the whole place was forgotten about until accidently rediscovered when a tunnel was broken into during a housing refurbishment in the 1960s. The structure of the local rock makes the construction of underground cities remarkably easy. It is soft enough to hew away but sufficiently strong to resist collapse. The tactical advantages of living underground are clear to see, but the cramped living conditions can hardly have been healthy ones. 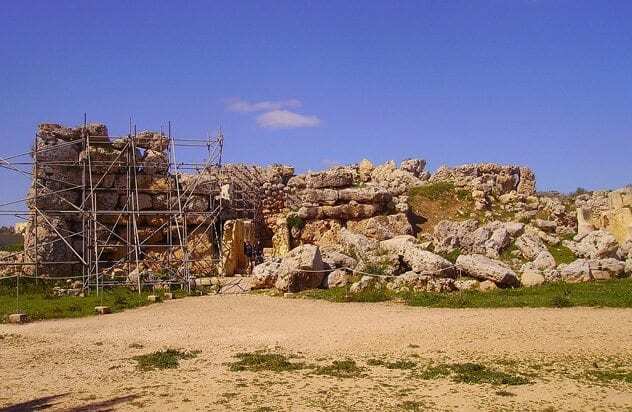 Ggantija is a megalithic temple complex on the island of Malta. Ggantija means “Giantess’s Tower,” and local legend has it that Ggantija was built by a giantess called Sasuna. She carried the enormous stones used at the site on her head. Some of these stones are over 5 meters in length. Ggantija is three temples built in the same area and surrounded by a wall. Begun around 3600 BC, these temples predate metal tools and the wheel on Malta. No wonder later generations thought only a giant could have built it. 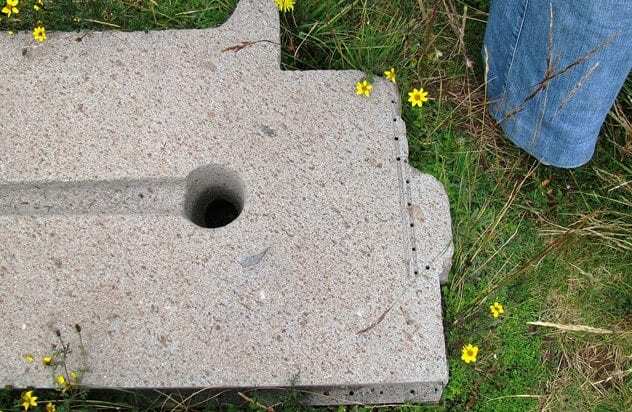 Small stone spheres have been found which may provide a clue as to how the blocks were moved—they were perhaps ball bearings placed beneath the stones. 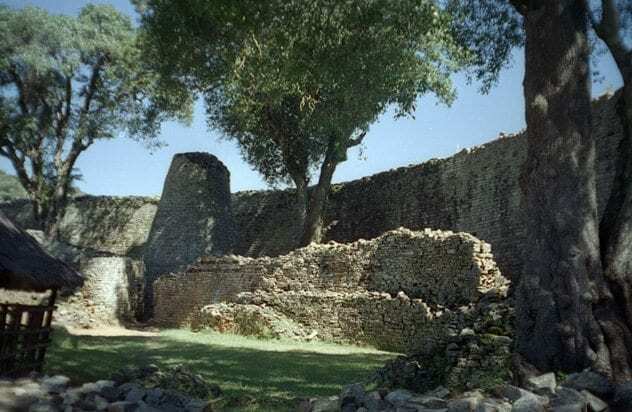 Great Zimbabwe is a ruined city forming the largest collection of ruins in Africa south of the Sahara. Local legend has it that it was here that the biblical Queen of Sheba had her capital. This is unlikely as the site was only built and occupied from the 11th to the 15th century. There is some debate as to who built Great Zimbabwe. In the past, this has been a politically fraught question, with the white government of Rhodesia unwilling to accept that the advanced city had been built by the native peoples. Now, there is general agreement that it was constructed by the ancestors of the Shona, though with some dissenters. At its height, around 18,000 people lived at Great Zimbabwe. The 5-meter-high walls that protect the site were made without the aid of mortar. 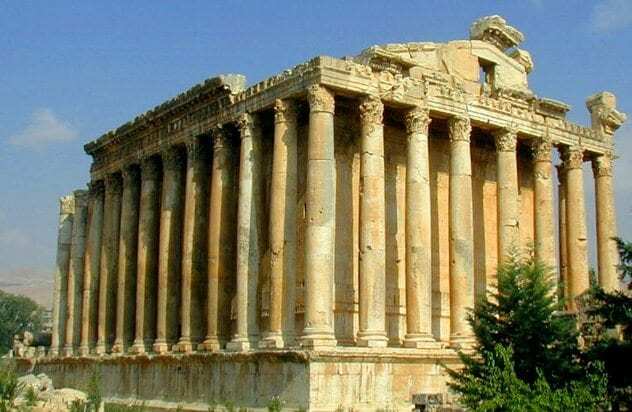 Baalbek in Lebanon reached its peak under the Roman Empire but had been a major city long before that. At the heart of the Roman city were a triad of temples raised in honor of Jupiter, Mercury, and Venus. While they were magnificent in the way all Classical temples were, at the base of the temple of Jupiter is a mysterious feature—three gigantic stones. 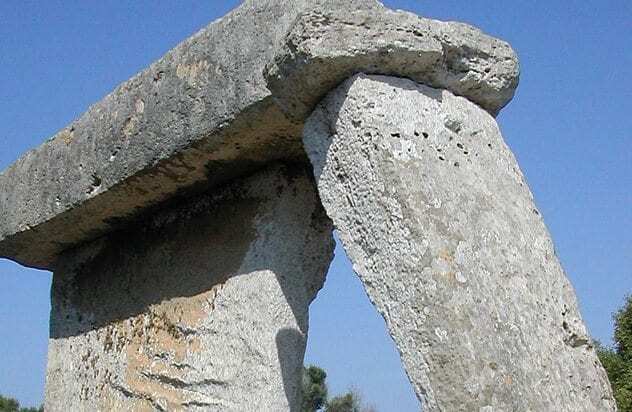 These three stones, weighing 800 tons each, are the largest stones ever used in construction. In the ancient world, the site was called the Trilithion (“Three stones”). But no one knows why such huge stones were used as a foundation. In a nearby quarry lie more squared-off monoliths, larger than the others, that were never completed or used. On the island of Menorca can be found huge T-shaped rock formations. Made from one stone resting on another, these Taulas are surrounded by walls with a single entrance. All but one of the Taulas are directed toward the south. We know that they were built by the Talaiotic Culture that existed on the island until the Roman conquest. Most seem to have been set up around 1000 BC. Clearly they have some ritual use, but no evidence has come down to us of their exact significance. One archaeologist has seen in the flat stone on top the horns of a bull and so suggested Taulas are sites of worship of a bull god. In Longyou, there was a belief that the local ponds were bottomless. No one settled the matter until 1992, when a villager drained one. The pond was a flooded man-made cavern. Other ponds were soon drained, and 27 such grottoes have been discovered. Clearly artificial, the grottoes were all carved by hand. None interconnect, but some are separated by only thin rock walls. The purpose of these caves is as unknown as the people who made them. It is thought that the water that once filled the caverns may have helped to stop them collapsing. Most people know of the Terracotta Warriors. These thousands of individual statues were placed around tomb of the Emperor to guard him in death. 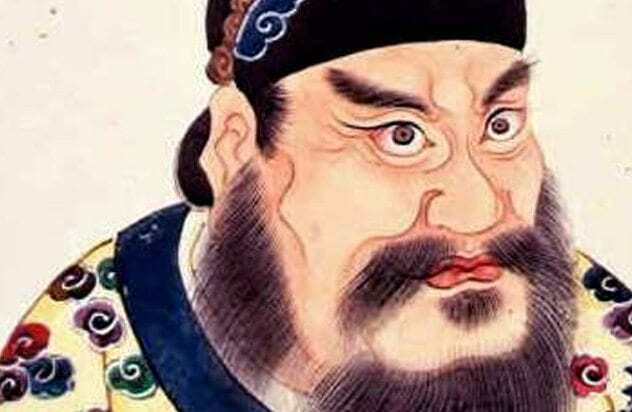 Records suggest that the Emperor is entombed in a palace built for him underneath a hill. We can see the hill, and there is evidence of empty spaces within. But the Chinese government will not allow excavation of the central tomb. This may seem perverse, but there is good reason to take our time. The scientific processes available to us are improving all the time. When the first terracotta warriors were unearthed, the pigments on them flaked away within seconds of exposure to air. Who knows what damage opening the tomb may cause? One thing we may find inside are vast pools of mercury. 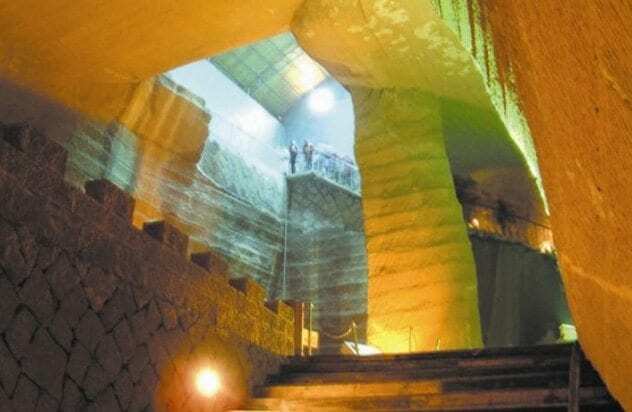 A Chinese historian said the tomb contained lakes and rivers of the liquid metal, and analysis of the soils at the site do contain mercury concentrations much higher than the surrounding area.